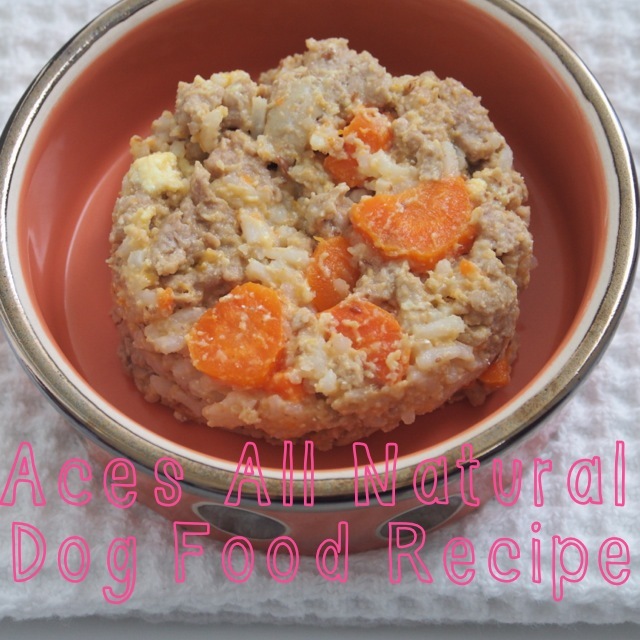 I promised a while back (pre-wedding craziness) that I would post the recipe that I make for Aces organic dog food. Since life is much less hectic, and we're back from honeymoon I wanted to share that recipe with you. Dog nutrition is a topic that has fascinated me for years. I don't think that a lot of people realize that many of the same foods that you & I enjoy can also be extremely healthy and beneficial for our pups as well. In this recipe there are very few ingredients that I use, but they all serve a purpose. Ground chicken is the base, along with white rice. White rice is actually better for dogs than brown rice as white rice is easier for them to digest. I also use 2 whole eggs blended until liquefied, shells included. The reason for that is because the egg shells are an excellent source of calcium and is easily absorbed into their system. The shells are also completely tasteless. Ground flax seed isn't only good for humans, our four legged friends benefit from the nutritional powerhouse as well! Just be careful to start your dog with small amounts and gradually build him up as the fiber content in flaxseed can have a laxative affect if fido isn't used to it! 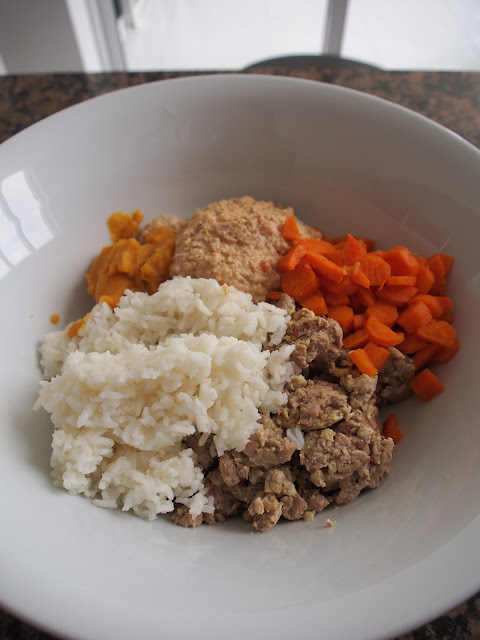 This recipe is extremely versatile and you can adjust the ingredients to suit your dogs tastes, replacing the canned squash for sweet potato or pumpkin, carrots for squash, etc. It is important to note that this recipe is lacking a few essential nutrients that are vital for dogs. I would need to add an additional 20-25 ingredients to this simple recipe to gain those nutrients. I add a daily supplement to his food to make up for the nutrient deficiency. That supplement is Dinovite. Adding this ensures that Ace isn't lacking any vitamins or minerals that he needs to stay healthy. This recipe feeds Ace (he weighs 13lbs) for approximately 5 days. Cook ground chicken in saute pan. 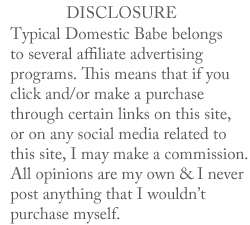 Do not add any additional oils. Once cooked, drain fat and set aside. Crack eggs open and place in blender (shells included! ); blend until liquefied. Incorporate eggs with chicken and cook over medium heat until eggs are thoroughly cooked. Time to make a "paste" to bind all the ingredients together: Using that same blender container, combine 2/3 c chicken/egg mixture, 1/3 c. rice, 2 tbsp carrots, and 1/3 c. chicken broth. Puree until creamy. In a large bowl, combine chicken/egg mixture with the remaining rice, and carrots. Add in pureed mixture, flax seed, and butternut squash and incorporate until all ingredients are combined. Using a baking sheet lined in parchment paper, measure out your dogs servings and make rounds for individual servings. I use a measuring cup packed to about 3/4 cup and just plop it down onto the baking sheet. The portion should come out easily. I usually store 2 days worth of food in an airtight container in the refrigerator and any remaining goes into the freezer. This is what your eggs should look like; frothy & liquid. Also, don't forget to follow me on bloglovin as Google Reader will be vanishing soon! Click on the link below. This is really nutritious homemade recipe I have ever seen till now. This is really great to know this recipe, now I can make my dog healthy and live long. Thanks for sharing this. What a great picture. He certainly looks health and happy! I agree that cooking your dog's food at home is the way to go! With well-balanced nutritional meals, your dog will be happy, healthy, and hopefully cancer free. I started my dog on a homemade diet after I found out he had food allergies. The symptoms from his allergies cleared up and he has a bright shiny coat. If anyone else is interested, I found the recipes I use here. Help your dog have a healthy long life by cooking at home. I'd love to make these for my dogs, but I've never seen canned butternut squash. What can I substitute for the squash? I do not drop a leave a response, but after reading a ton of responses on this page "Organic Homemade Dog Food Recipe". comments come across like they are written by brain dead visitors?